Go back a few years and ask an enthusiast of vintage airliners, what would be their ultimate trip and type to fly on, and the answer could jokingly of been ‘North Korea in an IL-18’! So, when the organized aviation tours in the DPRK (Democratic Peoples Republic of Korea) were first announced, it was hard to believe that such a thing could happen in the strict, closed society that is North Korea. Like a final frontier, this is one place which people never expected to ‘open up’ to the freedoms desired by aircraft enthusiasts, with no restrictions on civil aircraft photography. It’s still hard to understand how this change came about, knowing as we do, the lack of freedom for their own people, let alone ‘suspicious’ foreigners. However, after quite a few of these going ahead without any problems, it was time to take advantage of the opportunity, after Ian Allan announced their first tour, in conjunction with Juche Travel Services (based in London and Beijing) and the state-owned KITC (Korea International Travel Company) based in the DPRK capital, Pyongyang. 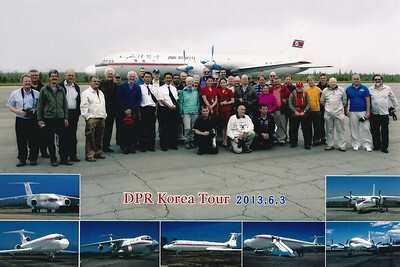 The aviation tours of the DPRK last for one week, and include a lot of ‘sightseeing’, which is unavoidable. For the hardened aircraft enthusiast, this could be seen as a major inconvenience. However, looking back, i can say that most of it is interesting enough, and well worth ‘putting up with’ for the chance to fly on every type operated by the national carrier Air Koryo. The line up… IL-18, IL-62, IL-76, Tu-134, TU-154B, Tu-204, An-24 and new An-148. Some of these classics can only be flown on in the DPRK now, such as the Tu-154B and IL-62 (unless you can get on a government operated aircraft), with Air Koryo likely to be the last commercial operator of some of the other types as well in the future. With previous photographs of CAAK/Air Koryo aircraft being limited to just two IL-62’s, things were about to change big time. Photographing the famous visit of P-885 to Manchester in 1991 (guess which one we were about to fly on! ), and catching P-882 at Moscow Sheremetyevo in 2003 were the only previous encounters before now. Unlike the Juche tours, which only feature the DPRK, the Ian Allan tour also included a few days around Beijing, for the chance of an organized visit to the amazing museum at Datangshan, and as an additional arrangement for myself, a visit to the collections at the Civil Aviation Museum and Tianjin, which are also a must for any serious ‘classic hunters’. Unfortunately, China can be compared to Japan these days, with no commercial ‘classics’ left in service. The days of the older Western and Soviet-era airliners are long gone, with the only chance to see some of these types now in the museums. Infact, further to this, as of January this year, all Soviet-era airliners were banned from China, meaning our flight to/from Pyongyang which was originally planned to be operated by IL-62, was now going to be a Tu-204. Being mostly interested in older classic airliners, i had thought that after getting all the museum aircraft around Beijing, i probably wouldn’t bother with China again, for yet more modern airliners. However, Shanghai for example, has a few more classics to offer (including the rare Chinese-built ‘707’), and you never know, maybe the military will ‘open up’ with more access one day! 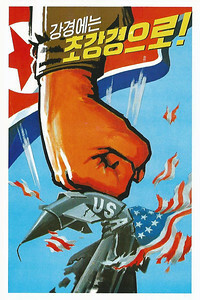 As for North Korea, i can only suggest you do it (if you can), while the chance is still there. There is no place like it on earth now. Flying from Bahrain with Emirates, first flight was EK836 operated by A330, departing at 0400 for Dubai, landing 1 hour later at 0600L. After earning enough air miles, i was able to upgrade the Beijing flight to business class, so the first benefit was heading straight to the lounge, to relax for the few hours lay over. Then connecting onto EK308, operated by 4 months old B777-300ER A6-ENE, departure was at 1100, landing 7.30 hours later at 2230. Not suprisingly, after no sleep overnight, those lay-flat seats in the airlines premier business class cabin (forget the A380! ), meant i slept almost all the way to Beijing. Of course, today was just a travelling day, flying against the time zones, with the re-arranged plan of getting to Beijing the night before the main group, for an extra night at the 5-star Langham Place hotel, to be fresh the next morning. Before then, the problem of getting through the airport had to be overcome. The issue of travelling to China on the new 72 hour no-visa transit rule, introduced in January, had been a problem from check-in at Bahrain. Despite clarifying the rule with Emirates and the Chinese embassy before flying, on checking-in i was told ‘where is your visa, you can’t fly without one’! After discussion with the airline supervisor, i was able to fly, but had to sign a form stating that the airline were not liable for any responsibility for me, if on getting to Beijing i was refused entry and had to arrange a flight out etc. Not a great start! The problem, it seems, is this new rule is still not understood by everyone yet, with even the separate no-visa transit desk at Beijing being unmanned. And so, after a long wait on arrival, in the end an Emirates staff member had to come out and complete a form, to allow my entry through immigration. Maybe the late arrival didn’t help, but in comparison, a few of the main group also flying ‘no-visa’ had no such problems, either on check-in at LHR, or on arrival at PEK, where they ‘breezed through in 30 seconds’! The Langham Place hotel is situated a short walk from Terminal 3 at Beijing, and is well placed for landing shots onto runway 36R, though through double glazed windows that don’t open. If paying the hefty price of staying here, a better option is to walk outside, either to the park and small lake over the road, or even better, walk up to the departures level of T3, where either side of the terminal offers good photospots, along the slip road, with zero hassle from the police etc. Of course, staying at one of the other nice hotels nearby, at half the price with free shuttle buses to T3, is an even better idea! And so, after catching a few hours sleep, i was woken by the first arrivals at around 0530. Still being half asleep and missing a DHL B757F, those then photographed from the hotel room, in the nice morning sunshine, while getting ready, included LOT B767-300ER SP-LPE (in Star Alliance ‘15 Years’ colours) and Yangtze River Express B737-300QC B-5057 (previously Condor/Lufthansa D-ABWE). Along with a few others, travelling to/from Beijing independently from the main group, we had the arrangement to meet with the Chinese guide in the hotel lobby this morning, to take our coach to the terminal and collect those coming in on the BA B747 from Heathrow. Seeing it was due at 0940, and knowing the time it takes to process through the airport, there was enough time to ask the driver to take us over to the East side of the runway 01 approach, for landing shots next to the perimeter fence. Bonus! Landings from the South are the most common at Beijing, with all 3 runways used to some extent. This morning 01 was being used the most, though 36L and 36R (the ‘centre’ runway) can also be used as much, if not all shared for arrivals. So, over the next hour or so, before being called to pick up the main group, those photographed included the said BA B747-400 G-BNLZ, suitably followed by Air Koryo Tu-204-100 P-633, Air China A330-200 B-6075 (in special ‘Zichin Hao’ colours), Air China B737-800 B-5176 (in special ‘MuDan Silver Peony’ colours), China Eastern A330-300X B-6125 (in special ‘Xinhua.net’ colours), Dalian Airlines/Air China B737-800 B-5197, Shanghai Airlines B767-300 B-2498, Xiamen Air B757-200 B-2868 and Air China B737-800 B-2642 (in special ‘China Flower Expo’ colours). Collecting the main group, red-eyed off the overnight BA, we then headed straight off to the Datangshan China Aviation Museum, 40km to the North of Beijing. This famous, large museum is actually named after the mountain located there, with part of the collection on display inside a cave, in the side of the mountain. This was originally part of the tunnels and undergound bunker system of the adjoining Shahe (or Shahezhen) Airbase, which currently has Y-5 (An-2 copy), Y-7 (An-24 copy) and Puma’s based (though not visible from the museum). With over 300 aircraft on display here, as listed on various websites, i will just mention a few of the highlights… First seen on entering the museum is a very nice row of aircraft, with Chinese AF IL-14P 4202 (used by Chairman Mao in 1957-58), ex China United IL-18V B-230 (painted as Chinese AF ‘232’ to represent another of Mao’s aircraft) and Chinese AF Viscount 843 50258 (also ex China United). Other British-built classics here include the first sight of a Chinese ‘Rodent’, with three present, Chinese AF Trident 1E 50051, Trident 2E 50055 and ex CAAC Trident 2E B-2202. 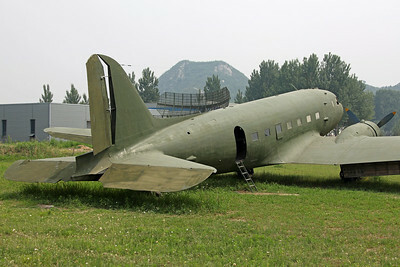 The latter is parked away from the museum area, and has had the rear fuselage/fin and wings removed (which are dumped next to a hangar, along with an Li-2 fuselage), with Chinese writing along the fuselage relating to the 21St Century Hotel in Beijing, where the aircraft was previously located, used as a disco. Sad! Of the many other classics present, IL-62 B-2024 was one of five operated by CAAC between 1971-1987, while Chinese AF Tu-124V 50256 is one of two on display here. These rare classics were re-painted not so long ago, as part of a lot of work done to clean up some of the aircraft here. Finally, another Western built classic here is DC-8-21 N220RB still in Orbis colours. Built as a DC-8-11 in 1960, it is the oldest surviving DC-8 in the world, being the 4th built! Used by Project Orbis Inc as a flying eye hospital from 1982 until 1994 (when replaced by a DC-10), it somehow ended up here, where at least it survives fully intact. After an overcast start here, thankfully the cloud had cleared after a while, as did the ‘hundreds’ of school children! From here it was straight back to the Langham, where we were to have a meeting prior to our departure tomorrow for Pyongyang. This was to receive our travel documents and DPRK tourist visa cards (no stamp in the passport), as well as receiving a brief on ‘do’s and don’ts’ etc. We were also told to sign a document stating that we would not photograph any military aircraft there, if we happened to see any… don’t know how legally binding that is though! After the final night in Beijing (for now), runway 36R was again being used first thing (which seems to be favoured for the early morning arrivals), so a few shots from the room and T3 photospot, again provided Yangtze River Express B737-300 Combi B-5057, along with B-5058 (previously D-ABWC). Nice SF Airlines (ShunFeng) B757-200SF B-2829 was followed by similar B-2899, and a few more special schemes, with Air China A330-200 B-6076 (in ‘Zichin Hao’ colours), Air France B777-300ER F-GZNE (in Skyteam colours) and Air China B777-200 B-2059 (in ‘Blue Phoenix Liner’ colours). Also from the T3 spot, the large FBO ramps are quite close by, with plenty of nice biz present (some ‘on’ for a distant shot), including Learjet 60 B-3926, Falcon 900LX B-8030, Gulf 450 B-8096, Challenger 300 B-8115 of Hanhwa Airlines, Gulf 550 B-8123, Gulf 550 B-8131, Gulf 200 B-8139, Gulf 550 B-8152, Gulf 450 B-8158, Gulf 450 B-8166, Global Express B-8199, Falcon 7X B-8201 (very nice colours), Gulf 450 B-8271, and Yanks Falcon 7X N138BT, Gulf 450 N167AD of TAG Aviation Asia and EMB-135BJ’s N688JC & N974EC (with the former belonging to Jackie Chan, painted in very loud colours!). Checking out of the hotel and heading to T2 for check-in to Pyongyang, Air Koryo flight JS152 was to be operated by Tu-204-100B P-633, which was already at the gate. This was the ‘204 recently involved in a runway overrun at Vladivostok, after landing on 1st March, though with only minor damage. Again, no problems taking pictures from inside the terminal, with others on for shots including Challenger 300 B-8190, KLM Asia B747-400 PH-BFF, Aeroflot A330-300X VP-BDE, Gulf 5SP M-GVSP, Korean Air B737-900 HL7718, Hainan Airlines A330-200 B-6133 (with ‘National Centre For The Performing Arts’ logo), Chongqing Airlines A320-200 B-6576 (‘Happy Chongqing’ flowers colours) and Hong Kong Airlines/Hainan Airlines A330-200 B-LND. Also photographed were Grandstar Cargo B747-400F B-2427 (stored for the past year, with cockpit windows and engines covered) and certainly todays highlight, Kazakhstan Tu-134A UN-65683. Reportedly operated by the Air Force/Border Guard, the housing for the Balkany HF antenna is still visible below the tail cone, where the ‘stinger tail’ was previously fitted. Classic. And so, it was the point of no return, and time to board the Tu-204, departing 30 minutes late at 1330 for the 1.5 hour flight, landing at 1600L (1 hour time difference). After taxying in past the first sight of some of the classics here and parking, our group were the last to leave the aircraft, after being given the chance to photograph the cockpit. The first instance of the great cooperation we were to get from the Air Koryo crews. Pyongyang Sunan International Airport has a strange layout, with two runways almost North-South of each other, meaning a long taxi from/to the furthest from the terminal. As well as a new looking VIP terminal, the airport currently has a lot of building work going on, with a new terminal being built. The current small terminal handles both arriving and departing passengers in the same area, though there are normally few flights, with Air China from Beijing several times a week being the only foreign carrier present. And that was it, no more aircraft until Monday, with the rest of today and Sunday being taken up with sightseeing etc. Trying not to dwell too much on the politics of the country, the first and lasting impression was the extensive use of (almost any) land available, for rice/crop production, as the country tries to feed themselves, now that the food aid from overseas has dried up. This includes using the land inside the airport boundary, with ‘the people’ toiling away in paddy fields close to the taxiways etc! So, following the slightly nervous, but quite easy process through the small terminal, it was straight onto coaches and into the city for the first bits of ‘culture’. Highlight was a visit to the Mansudae Grand Monument, with 20 metres high bronze statues of previous leaders, Kim Il-Sung and Kim Jong-Il. Here we were given the chance to buy flowers and ‘pay our respects’, before being told to line up and bow. The first bizarre experience! Asking our guides about the story of the jacket being changed on the Kim Jong-Il statue, they denied any knowledge and seemed to think it was a strange question. Google it! Our stay in central Pyongyang was at the 3 star Koryo Hotel (rated 5 star in DPRK). With 43 floors, the twin-towered hotel is one of the largest in the country. After the first night here, todays plan was to visit the DMZ (Demilitarized Zone), the buffer zone between North and South Korea which runs along the 38th Parallel. Despite the term, it is in fact the most heavily militarized border in the world! A two hour drive from Pyongyang, the JSA (Joint Security Area) is also known as the ‘Truce Village’, and is the only place on the DMZ where North and South Korean forces face each other. Being told about the history of the border from the North Korean perspective was certainly ‘interesting’. Just North of the DMZ here is the historic city of Kaesong, which is a former capitol of Korea during the Koryo dynasty, and is famous for its ginseng. Here we had a ‘royal court’ meal in the tradional manner, sat on the floor. Those that wanted ‘Boshintang’ had to pay 5 Euros… that’s dog soup bye the way! I think those that tried it felt a bit ‘rough’ after… doesn’t matter! From here it was back to Pyongyang, via a couple of more monuments. Time for a classic… Todays plan was a charter in Air Koryo IL-18D P-835 to Samjiyon, in the NE of the country. Arriving at the airport, a few other aircraft of the fleet were good for shots in the nice morning sunlight, including the An-148 P-671 which was just departing. Our flight was JS5105, and on starting and taxi, the memories were coming back of the 2009 flight in ER-ICB in Moldova. The distinctive sound and vibration of those four Ivchenko AI-20M turboprops, with the usual long pause and run-up before take off. In flight, the forward cabin is quite noisy, though nobody was there for the ‘comfort’, being the popular place to photograph and video those engines through the large windows. Take off was at 0915, landing 55 minutes later at 1010. Samjiyon is actually a military airbase, with a resident Mig-15UTI training squadron, along with some Mil-8’s present. Parking close to the ‘terminal’, two Mil-8’s (263 & 264) were very close by, with personnel present, who must have been bemused by the large group of westerners who had got off and started photographing their IL-18 and crew. Also, if some cameras seemed to be finding it difficult to focus on the IL-18, but on the subject behind… i couldn’t possibly comment! Samjiyon was being visited for the nearby famous Mount Paektu and other places of interest locally. Before heading off, a short question and answer session with our IL-18 captain was held. The most important question… for how much longer will the IL-18 remain in service… answer, 15 years! Time will tell… maybe dreaded ATR’s will be here before then! First stop then, was the Ri Myung Su waterfall and hot spring, where we had lunch, before going on to the ‘secret Paektu camp’ in the dense forest around the mountain, said to be where Kim Il-Sung organized the resistance army against the Japanese occupation in WWII, and where his son, Kim Jong-Il was said to be born (although apparently he was born in Khabarovsk, Russia!). Unfortunately, the visit up Mount Paektu had to be cancelled due to the road up there being blocked by ice and snow. Apparently, only one of the aviation tours here has ever made it up there! The active volcanic mountain is actually on the (disputed) border between the DPRK and China, featuring a large crater lake called Heaven Lake, which is considered to be sacred by Koreans. So, it was on to the hotel, earlier than planned, though the chance to chill out and have a drink wasn’t a bad thing. The Be Gae Bong hotel is considered very luxurious out here, obviously built for the party elite and rarely used, it does look out of place in this rural area, which also has Presidential palaces for the last two leaders. After the one night here and some sightseeing this morning, our return charter in Air Koryo IL-18D P-835 from Samjiyon back to Pyongyang, was ready and waiting, after the aircraft had night stopped for us. Departing at 1325 for the one hour flight as JS156, on arrival we then had chance to visit and photograph the restored IL-14P, as well as the other aircraft parked nearby, in the nice weather. 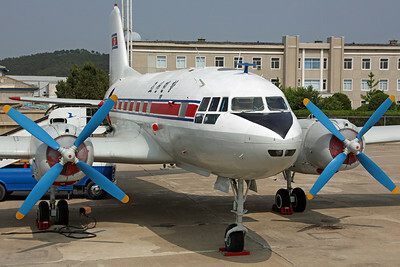 IL-14P 535 (no prefix) was previously used by leader Kim Il-Sung as a VIP transport, and was only restored last year, being ‘discovered’ by the first aviation tour group here (and so the outside world!). Now looking immaculate, outside and inside, our Air Koryo hosts kindly let us look at and photograph the interior, with the cockpit looking almost too new, and a picture on the bulkhead wall showing Kim Il-Sung and the Russian ambassador getting off the aircraft in 1959. Thought to be ex military, the picture shows, what appears to be the last digit of registration/serial number ‘1’. Now re-painted into the Air Koryo colours, it doesn’t carry those titles, but just the ‘CAAK’ (Civil Aviation Administration of Korea), or Chosonminhang as the airline was previously known as (until 1992). Our hosts were proud to tell us (as they have previous groups) that the aircraft is infact airworthy, but that there are no pilots qualified to fly it! If indeed it is (and i doubt it), one report states the aircraft will be taken to the city anyway, for display in an exhibition/museum. Any future developments with this amazing classic will no doubt be reported on by future tour groups. Back in Pyongyang, at the Koryo hotel, today was the ‘big day’, with our busy programme of pleasure flights. Sods law, the weather was a bit overcast, as we headed straight to the airport where our first classic was ready and waiting. For me the IL-62 was going to be the highlight, as having never flown on one, i understand there are now no other commercial flights with the type in the world, after Cubana retired its last aircraft two years ago. Also, the similarity to the classic, elegant VC-10, helps make this a favourite, so was determined (and fortunate enough) to get the ideal rear window seat, looking out at those awesome Soloviev D-30KU turbofans, to photograph and video the flight from. Our aircraft was IL-62M P-885, with flight JS5100 airborne at 0840 for the 25 minute pleasure flight (‘pleasure’ being the word). Great aircraft, and what a sound. With little time to catch our breath after that, on leaving the aircraft, our next ride was ready and waiting! Coming a close second to the ‘62, the IL-76 was highly anticipated by the group, as again, the chance to fly on one is very rare, although one or two of the group had been on the (only known) enthusiasts charter in one, in Minsk a few years ago. Of course, the big unknown with this thing, was the comfort/safety concerns of flying in a cargo aircraft! Fitted with bench seats along the sides of the cabin (sorry, cargo hold), with no seat belts, we new we were in for a ‘ride’! Also, with only a couple of small windows, the flight experience was going to be more about the sound and feel of the ride, with the landing quite unusual in that (most onboard) never knew when the thump and jolt on touchdown was going to happen! Our aircraft was IL-76MD P-912, with flight JS5200 airborne at 1010, again for a 25 minute flight. On the take off roll, Andy sat next to me, or should i say kneeling on his seat while videoing out of the window, underestimated the ‘pull’ of the acceleration, and almost went rolling to the back of the aircraft, grabbing hold of (and almost taking) me with him! For the landing, we swopped, so i could video outside. Of course, not wanting to make a fool of myself, i made sure i had a firm position and grip for the touchdown and braking! For half the group, that was enough excitement for now, as we would be returning to the terminal for lunch. The An-24 was actually going to be two flights, so that everyone could have a window seat, with the other half of the group going first. Their aircraft was older An-24B P-537, for flight JS5300, which they boarded as we headed off for the break. After lunch it was our turn, with a different aircraft ready! Flight JS5400 was operated by An-24RV P-533, airborne at 1410 for the 30 minute flight. Again, on landing, the groups next aircraft was ready and waiting. Tu-134B-3 P-814 as JS5500 was airborne at 1530, again for a 30 minute pleasure flight. Nice smooth ride in this pocket rocket, with the unusual feature of being able to photograph the top half of the tail fin while in flight, through the rear toilet skylight window! Finally, one last flight today for (most of) the group was in the An-148 P-671 as JS5600. A few of us had decided to sit this optional one out, as although a rare type to fly on ‘it just ain’t a classic’! As well as all these, while out on the ramp, the Tu-204 on the Beijing flight taxied in very close by, giving us the best shots of the shorter -300 P-632. So what a fantastic day, with great organization by Air Koryo, to make all those flights run so smoothly. As with all our Air Koryo flights, on landing, we had the chance to visit and photograph the cockpit, followed by a group photograph in front of the aircraft. Theres not really much more they can do for you… no, unfortunately they wont allow jump seat rides! As mentioned, most of the sightseeing planned by the guides had been interesting enough. However, the group were not really looking forward to todays plan, to be honest. Although the Tu-154 flight to the DPRK’s second city, Hamhung, was of course a great thought, the visit to the Hungnam fertilizer complex there certainly wasn’t! ‘Admiring’ North Korea's industry in action, with the added bonus of the ‘fantastic’ smell, would have tested the most tolerant of the group! So, it was with quiet relief (not wanting to offend our hosts), when our flight was at first delayed, then cancelled, due to bad weather in Hamhung. Bummer! Again though, the impressive organization of our guides and Air Koryo, had an alternative plan for the day, set up in no time at all. Instead, we would now take a one hour pleasure flight in the ‘154, followed by a drive out to a luxury hotel in the hills to the North of Pyongyang! So, again getting a rear ‘engine view’ window seat, on Tu-154B P-552, our flight JS5105 was airborne at 1010, for the exactly 1 hour pleasure flight. Some were joking that we now had only the one flight on the ‘154, instead of the two (return). 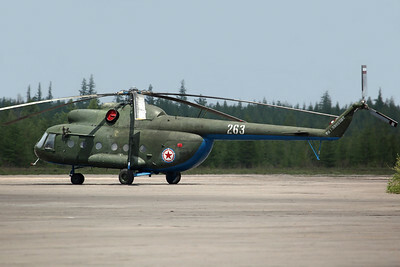 However, Hamhung was only 20 minutes away, so now we actually had an extra 20 minutes flying time in this rare type! Again used for this flight, mention has to be made of the vintage Air Koryo passenger steps truck (check it out in the 154 shot)… looks like West Coast Customs had been at it! Smart. Following this, we headed off on the 150km drive North, to a place called Myohyang. This name is derived from the sacred mountain, Myohyangsan, which translates as ‘mysterious fragrant mountain’, and according to legend, was the home of King Tangun, the forefather of the Korean people. In 2009, UNESCO designated the mountain area as a world biosphere reserve, with several hiking routes attracting tourists to the area. To cater for this, the luxury Hyangsan hotel is nearby, and was to be our home for the night. Designated as a (DPRK) 6 star, the hotel is certainly impressive, dominating the end of a valley, though of course is only used by the party elite and foreign tourists, so is empty most of the time. The very classy interior also features a rotating restaurant on the top floor, though was closed (and maybe never been opened?). This morning, we planned to visit a couple of the major tourist attractions in the Myohyang area, before heading back to Pyongyang. First was the Pohyon Temple, which was founded almost a thousand years ago. Of course, recent history has not been kind to the Buddhist religion here, under the Japanese rule, followed by the communist revolution, which actively ‘discouraged’ religion (now having their ‘Kim’ gods), resulting in most of the countries temples being destroyed, apart from a few in more rural areas. As if that wasn’t bad enough, the Pohyon Temple complex was then bombed during the Korean War. However, since then, it has been partly reconstructed and preserved ‘as decreed and funded by Kim Il-Sung’. From here, we then visited the International Friendship Exhibition, a large museum complex that houses gifts given to the last two leaders from foreign dignitaries. This place really is amazing, even if it was built to convince visitors that the North Korean leaders are universally admired. Of course, most gifts are from fellow (then) communist countries and their leaders, as well as other dictators. Unfortunately, no photographs allowed here, with shoes covered and through a metal detector on entry. Visiting the many rooms inside, displaying the approximately 200,000 items, there was also another bowing session in front of an exact wax figure of Kim Il-Sung and his missus (‘hands out your pockets and behave yourselves’!). Difficult to single out the most impressive gifts, but they include armoured train carriages from Chairman Mao, a bullet-proof limo from Stalin, a bears head from Ceausescu, ornate chess board from Gaddafi, crocodile skin suitcase from Castro, gem-encrusted silver sword from Yasser Arafat, and a Michael Jordan signed basketball from US Sec of State, Madeleine Albright. Not suprisingly, China and the Soviet Union have entire wings dedicated to their gifts, whereas (non-Communist) Europe’s is pitiful! Of course, Western leaders have (almost) never met with the regimes leaders, so there has never been any exchange of gifts. Asking this question, apparently only a Portuguese leader and Mitterrand from France have met a ‘Kim’ (along with (ex) President Carter, who has been here several times on peace missions). Having a close look at gifts from the UK (organisations), noticeable was a plate from the NUM (our ‘reds’), to their fellow comrades! Returning to Pyongyang on our last full day in the DPRK, we had a few more visits planned. The railway museum is of course just about the trains that the leaders have used, while the metro system certainly is impressive. Seen as a great national achievement, the Pyongyang metro is the deepest in the world, at around 110 metres below ground, and features stations with lavish use of marble, chandeliers, murals and sculptures (of guess who). Apparently built so deeply, as to also act as an underground bunker system in time of war (hence fitted with large steel doors), we took a ride of 5 stops, starting at the Puhung station, passing under the Taedong river. At the other end, the ‘Arch of Triumph’. Modelled after the one in Paris, but slightly larger (at 60 metres high, the worlds tallest), it was built to commemorate the Korean resistance to Japan. Yet another of Pyongyang’s monuments, i have only mentioned a few of the sights seen around the capitol. Others include the tall TV Tower (with a restaurant at 150 metres), and the controversial Ryugyong hotel, a massive 105 story pyramid-shaped skyscraper. Construction began in 1987, but has been halted many times, with the exterior only recently completed. Another ‘attraction’, which unfortunately we were unable to visit (‘as it was being refurbished’) was the USS Pueblo ‘spy ship’. Captured in 1968 after the North says it strayed into their waters (which the US denies), it is still commissioned as a US Navy vessel, and the only one held captive in the world. Passing by its current location a few times, it became a group joke to ask if we could stop (especially from John, our American on the tour). Also, mention has to be made of the famous Pyongyang traffic girls, who direct the traffic at busy intersections, and salute passing officials (i presume going by the number plate?). Most don’t like being photographed, although they must get it all the time from tourists, wearing those ‘cute’ uniforms! Driving around the city, we had also got used to seeing the propoganda billboards, which are quite amusing, being a mix of pro-Kim and anti-US sentiment. Infact, some of these (and other similar) designs can be purchased as postcards and posters (see the one postcard scan), with an original canvas of ‘revolutionary art’ also picked up (as was a bottle of ‘Adder Liquor’, with the quite large snake in there!). Also, as well as the group shot photographs (yours truly second from the right BTW) and a professionally produced DVD of our full tour (we had wondered why that guy with a video camera was following us around), we could also purchase a set of Air Koryo goodies. The pack includes enlarged prints of Air Koryo stamps, an Air Koryo notebook and timetable, and a set of 8 original new safety cards (though no IL-76! ), which saves stealing them on the flights! Some nice keepsakes from a very memorable tour here. Of the IL-62 fleet, two others (not seen) are the Government aircraft, P-618 and P-882. Also, no sign of the ex Cubana IL-62M now. CU-T1280 was delivered in July 2012 and became P-886P. Parked on the maintenance ramp, retaining the Cubana colours with the titles removed, it was reported to have been purchased for spare parts. Now said to have been moved inside a maintenance hangar and ‘broken up’ (or maybe just parked in there, is not confirmed). As for the future of Air Koryo, there are various reports of further modernization, with the possibility of the IL-96 and Superjet 100 joining the fleet. Maybe the latter won’t happen, after receiving the An-148 (with one more on order). A brief talk from an airline representative, gave mention of plans to create a new domestic airline, operating some of the older Soviet-built types, while the ‘international’ airline would re-equip with modern (possibly Western-built) aircraft. Back into China, with thankfully no grief with the 72 hour no-visa transit process this time, the bad news was the weather, with the infamous thick smog that blights Beijing from time to time (and they call us Smoggies!). Looking like the rest of the afternoon was going to be a wipe-out, i headed to my hotel, after saying farewell to the group. Now doing my own thing for the next three days, i was staying at the CITIC hotel, close to the runway 36L approach. Again, a nice hotel, but around half the price of the Langham, it is still reported as a good ‘spotters hotel’. Similar to the Langham though, photography is through double glazed glass, so if you want the best shots, you would still need to go outside to one of the photospots. So, a good day to catch up with some sleep, some good food, and get online for the first time in eight days! A full, free day in Beijing, was to be spent at the good photospot outside T3, overlooking the final approach and departures on runway 36R, with shots also possible of aircraft on finals to runway 01. From here, 36L approaches are too far for decent shots, though would be fine for the pen and paper types. Again, the weather wasn’t exactly glorious, though the smog had gone, after some rain overnight. Highlights today then… Donghai Airlines B737-300SF B-2897, Shandong Airlines B737-800 B-5453, China Eastern A330-300E B-6100 (in special ‘Shanghai Expo 2010’ colours), Air China Cargo B747-400BCF B-2458, Tianjin Airlines ERJ-190LR B-3171, Xiamen Airlines B757-200 B-2868, Air China A321-200 B-6361 (in special ‘Beautiful Sichuan’ colours), Korean Air B737-900 HL7599, Philippine Airlines A320-200 RP-C8609, JAL B787-800 JA828J, SAS A340-300X LN-RKG, Dalian Airlines B737-800 B-5196, ANA B787-800 JA808A, China Southern A380-800 B-6140, Shanghai Airlines B757-200 B-2843, Air China B777-300ER B-2037 (delivered 23rd April), SriLankan A340-300X 4R-ADF, ANA B787-800 JA802A, Air Macau A321-200 B-MAJ (in special ‘4th East Asian Games 2005’ colours), Air China B737-800 B-5390 (in special ‘Gold Peony’ colours), Hainan Airlines A340-600 B-6510, Xiamen Airlines B757-200 B-2869, Grand China Air B737-800 B-2652, Hainan Airlines B737-800 B-5136 (with special logos), Hainan Airlines A330-200 B-6088 (with ‘Dynasty’ logo), China Eastern A330-300X B-6119 (with a green leaf logo, being Yunnan based), and from China Southern, B757-200 B-2830, A330-200 B-6057 (in special ‘16th Asian Games Guangzhou 2010’ colours) and the first 787 in China, China Southern B787-800 B-2725. Delivered on the 2nd June and put into service on the 6th from Guangzhou to Beijing, it features a special scheme (after originally being painted in the standard scheme). Nice. Also today, biz-Jets arrivals were Gulf 550 B-8157, Gulf 550 N816MG of Chevron USA Inc and Falcon 2000LX N2000A. While those parked up (and not already mentioned) included CL605 B-3566, Gulf 200 B-8277, Challenger 850 M-HLAN (ex A6-JET), Gulf 450 N383KK and Gulf 450 VP-CTH. Today i had an arrangement for a private car and guide, to visit the Civil Aviation Museum and the collection at Tianjin. The Civil Aviation Museum, not far to the SW of Beijing PEK, was actually closed, as the main building is being refurbished, but through Ian Allan’s contacts here, special access was arranged. Getting there just as the sun was coming out (makes a change), the collection is almost entirely outside anyway, and features some real classic stuff. Highlight had to be another Chinese Rodent, with ex CAAC Trident 1E B-2207. Parked next to this is ex China Eastern A310-200 B-2301, the very first Airbus aircraft in China. Delivered in June 85, it was later donated to the museum after being retired in September 2006. The other modern airliner here, and another British-built, is ex China Eastern BAe146-100 B-2701. Again, the first of the type in the country, delivered in September 1986, all 146’s were retired in China by the end of 2004. Since then the original China Northwest cheatlines have been restored, though with no titles or tail logo. Three prop-types present are China Southern Y-7 (An-24RV) B-3456, Wuhan Airlines Y-7-100 B-3471 (this upgraded version has winglets and Western avionics) and CAAC Y-5 (An-2) 8607. Others outside include Chinese AF Chengdu JJ-5 (two-seat Mig-17) 201238 and three unidentified Chinese AF ‘propliners’, a nice C-46 in a white scheme, and two Li-2’s (C-47’s), one in a bare metal scheme and the other in a brown camo. Also, looking inside the main building’s restoration area, i was able to photograph freely, even though there were guys working on the Mil. Here was classic ex CAAC IL-14 B-4208 (with its left outer wing removed), ex Nanjing University College of Civil Aviation Y-5 (An-2) B-8404, ex Xinjiang General Aviation Harbin Y-11 B-3888 (with wings and engines removed) and ex China General Aviation Mil-8 B-7803. Of these, B-2136 was the last of the 21 Chinese-built MD-82’s, assembled in Shanghai, and operated the final Chinese MD-80 flight in March 2009. B-8073 is presumed to be a Y-5B-100, as fitted with ‘triple tipsails’ (modified wingtips with 3 large vortex generators), with a couple of the Y-5’s also still showing faded China Eastern colours! As well as the 5th Trident of the trip, the highlight for me here is the classic 707, which apparently arrived for use as a trainer with CAAC over 30 years ago (December 1982)! Pretty much fully intact, with engines and undercarriage doors removed, it was reportedly last operated by Guy America Airways, though has ‘American Overseas’ titles clearly visible. From the ramp, the runway and taxiways are close by, so providing a few good shots of the following movements while here…Hainan Airlines B737-800 B-5416, Shanghai Airlines B757-200 B-2876 (the last B757 built), Xiamen Airlines B737-800 B-5305, Shandong Airlines B737-800’s B-5592 & B-5656, JAL B737-800 JA315J, Sichuan Airlines A320-200 B-6955, Korean Air B737-900 HL7705, Air China B737-700 B-5211 (in special ‘Pink Peony’ colours) and departing Asiana Cargo B767-300ERF HL7507. Also, the next ramp had Tianjin Airlines ERJ-190LR B-3186, while a ramp a bit further along had some nice stuff… CACAST (China Academy of Civil Aviation Science and Technology) B737-300 B-2950 (ex Air China), brand new CL605 B-7799 of Zyb Lily Jet (delivered 25th April), CFSA (China Flight Simulation Association) P-180 Avanti B-8310 (with another parked behind) and Learjet 60 N668JH. Also here were a few more biz-jets, an AVIC Y-12, and at least six Hainan Airlines Dornier 328JET’s parked/stored. From here, it was straight back to the hotel, to check-out and spend the last few hours of daylight at the Beijing T3 photospot, before checking in for the flight home. Highlights were Air China A340-300X B-2388, JuneYao Airlines A320-200 B-6788, Air China A320-200 B-6610 (in special ‘Hubei Plum Blossom’ colours), PIA A310-300 AP-BEC, Yangtze River Express B747-400BDSF B-2437, China Eastern B737-700 B-5282 (Yunnan green leaf logo), Air China Cargo B747-400F B-2475, Air China A321-200 B-6365 (in special ‘Beautiful Sichuan’ colours), Xiamen Airlines B737-800 B-5512, Shandong Airlines B737-800 B-5117, Shenzhen Airlines B737-900 B-5103, Xiamen Airlines B757-200 B-2866, Shanghai Airlines B757-200 B-2843, Sichuan Airlines A320-200 B-6049, Korean Air B737-900 HL7718, Shandong Airlines B737-800 B-5591, Shanghai Airlines B757-200 B-2850, China Southern B777-200ER B-2056 (‘Skyteam’ colours) and Southern Air B747-400BDSF N400SA which was pulled out and back into the Ameco hangar. Some beautiful sunset shots to finish the day off, then after proceeding through check-in, some nice night shots at the international gates provided ANA B767-300ER JA619A, Air China B777-300ER B-2031, Turkish Airlines B777-300ER TC-JJN, Egyptair A330-200 SU-GCG, Cathay Pacific A330-200X B-LAL, Ethiopian Airlines B787-800 ET-AOQ, JAL B767-300ER JA614J and Dragonair A330-300X B-HWK. And so, departing just after midnight on EK307 to Dubai, operated by A380-800 A6-EED, departure was at 0010, landing 7.20 hours later at 0430L. Connecting onto EK837 to Bahrain, operated by B777-300ER A6-EBU, departure was late at 0920, landing 45 minutes later at 0905L. With a bit of a sandstorm going on, the visibilty in Bahrain wasn’t great, though after getting to the car and the end of the runway, it was improving a bit. I had planned on staying a few hours this morning, before heading ‘home’, to catch the ‘Tuesday classic’ here. Air Transport International have been operating their DC-8-72CF N721CX into Bahrain for a while now, flying for the US militay as ‘Camber 116’ from/to Diego Garcia. Originating from Yokota Airbase in Japan, routing via Paya Lebar Airbase in Singapore to Diego Garcia, the US military maintain a tracking station and bomber base on the (British) Indian Ocean island, with ATN providing a scheduled service for personel and cargo movement using their DC-8 combi. With the DC-8 operations coming to an end soon, as the airline replaces them with B757’s, this was possibly my last chance to shoot this classic 8 again. Before this, just the one other arrival of note this morning, was executive B757-200 N757MA of Mid East Jet. Then, on time as usual, CMB116 arrived just after mid-day, providing one final classic at the end of a very special trip for vintage airliners. 535 IL-14P CAAK. Preserved Pyongyang 4/6/13.